Your information has been received. Please check your inbox right away for the confirmation email I just sent you. (Please also check your bulk/junk/spam folder as sometimes messages are mistakenly filtered as such). The email will be from “Mike, Workout Finishers”. 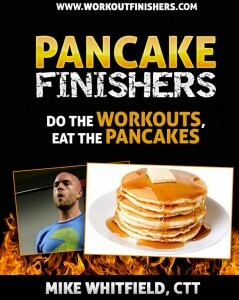 Once you confirm your address by clicking on the email I just sent, I’ll immediately send you a follow-up email with a download link to your FREE copy of “Pancake Finishers”… Yeah, Pancake Finishers.